We're painfully aware that many young children miss out on critical learning opportunities well before their first day of Kindergarten. So when Detroit Head Start asked us to breathe new life into their powerful program, we didn't hesitate to raise our hand. Armed with funding from the Southeast Michigan Early Childhood Innovation Fund and a partnership with the Head Start Learning Network, we set out to create a unified brand, align ten nonprofit Head Start providers and share the news that additional funding had just created hundreds of new spots for Detroit-area children. We held several listening sessions with the new provider agencies and current and prospective parents to give shape to our brand campaign. 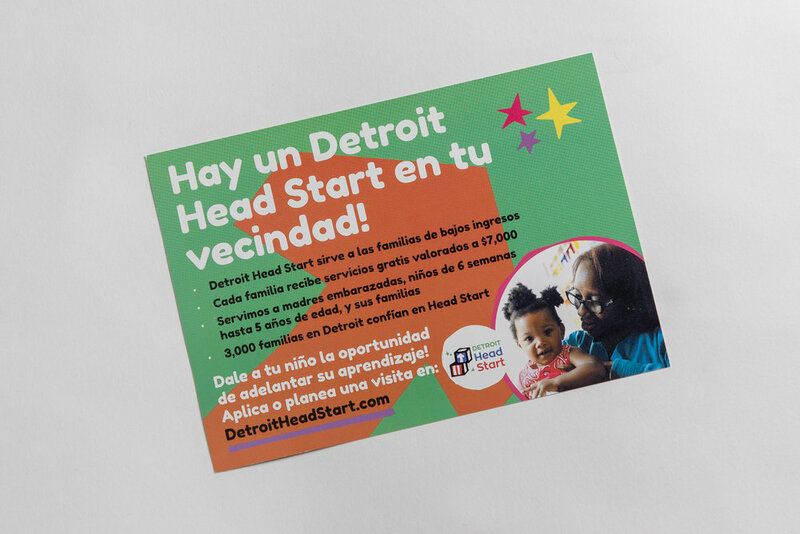 We also launched a Facebook page and DetroitHeadStart.com, as a central resource for parents to find a center in their neighborhood, hear from teachers and other parents the value of Head Start and take immediate action online to connect with a center. The citywide effort attracted media attention and site visits from local and state government officials. Word spread quickly that there were open seats for Detroit’s youngest learners, resulting in a 100 percent increase in enrollment over the previous year. Our work with Detroit Head Start continues to evolve, with the added focus of talent recruitment. Teachers are key to high quality early childhood education. Yet, these positions in Early Head Start and Head Start are chronically hard to fill. We produced the Head Start Educator Report to examine the barriers and identify opportunities for improved recruitment. Now, through centralized career information, job fairs and outreach to local universities and colleges, we are helping Head Start agencies build the pool of qualified educators.